Welcome to the HLHS Drama Club page! Drama club is open to any and every student enrolled at HLHS. Open enrollment for membership is the first four weeks of each fall. Students who transfer in during the school year can also join after enrollment has closed. 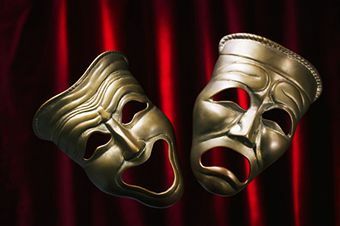 The purpose of drama club is to give students opportunities to participate in and experience theatrical events. The club also serves to support the theatre department through fundraising. Students who participate in drama club can earn service points that cumulate toward induction into the International Thespian Society (ITS). This is an honor society based upon activity in high school theatre and several scholarship opportunities are available. Through ITS students can also letter in theatre. For more information about what the theatre department is currently working on check out the theatre page by clicking on the fine arts tab in the menu on the left. You can also find us other places on the web.